The Liverpool & Manchester Railway (L&MR) opened in 1830 and Reid's Farm was an early stopping-place, first appearing in fare schedules in 1831. The first part of this post looked at how Reid's Farm got and lost its name, subsequently becoming known as Barton Moss (which I take to be a subset of Chat Moss in the context of this post). Here I conjecture as to its visual appearance but first address the question of the number of stopping-places on the Moss. As ever, much is drawn from Thomas (1980). How many stopping-places on Chat Moss in 1831? The 1831 fares schedule lists just two, Bury Lane to the west and the subject of this post, Reid's Farm (also known as Barton Moss 1), to the east. Both were close to roads running perpendicular to the railway and also to the extremities of the moss. I have yet to identify a map of the area prior to 1845 by which time the landscape may have changed significantly. However, in the case of Bury Lane it seems the railway was carried over the road by a bridge but at Reid's Farm there is no continuation of the unnamed farm track leading off Fiddlers Lane. The railway appears to have sliced through the northern tip of the land let to Edward Baines and managed by Reed so access to the residual fields north of the line would have been required. There was a narrow gauge railway running on the approach road to the south. It was used to ferry manure up the track from the River Irwell so some kind of crossing might be expected and hence perhaps the need for staff and the evolution of a stopping-place. According to Thomas, a contract was signed with the L&MR by "Chat Moss Farm" in April 1832 to supply manure by rail at 1s 6d (7.5p) per ton. However, this presumably did not involve Reed's Barton Moss Farm or he would have mentioned it to the parliamentary committee in 1833. Thomas also states that the L&MR had six buildings of wood or stone (not brick?) on the Moss as early as 1830, plus a smithy. Some of these were presumably for gatekeepers who likely fulfilled some of the function of the early policemen. On opening there were approximately 60 policemen along the length of the L&MR. This suggests one every half-mile although it is likely that they were more densely clustered in busy areas around junctions. By 1832 there were 52 but that number was cut by 20 in what was a bad year for passenger numbers, probably due to the major outbreak of cholera. The 1840s map suggests additional crossings at Astley and Lamb's Cottage, both of which subsequently became stations for a time, so that suggests possibly four men on the Moss able to stop trains on request. Another station, Flow Moss, east of Bury Lane, opened sometime between 1832 and 1838 (at the request of farmers so perhaps this was the station also called McGrath's Farm) but was not on a crossing and hence presumably unmanned prior to becoming an official station. Perhaps specifying just two locations in the 1831 fares schedule was an attempt to limit the number of potential stopping places and hence minimise operating delays. The notion that there were just two stopping-places on Chat Moss in 1831 helps in the interpretation of the visual record from that year. There are two famous pictures of early company buildings on Chat Moss, one by Thomas Talbot Bury, the other by Isaac Shaw. 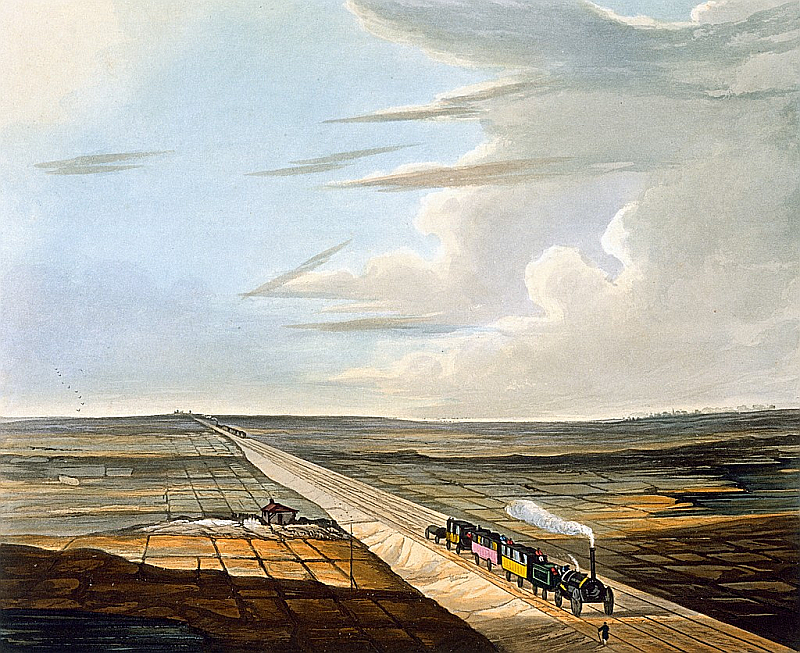 Bury's elevated perspective (1833 revision, Wikimedia) shows tracks on the causeway stretching into the distance. The shadows suggest we are looking west towards Liverpool. There is probably a degree of artistic licence as the two trains appear to be on the wrong tracks. 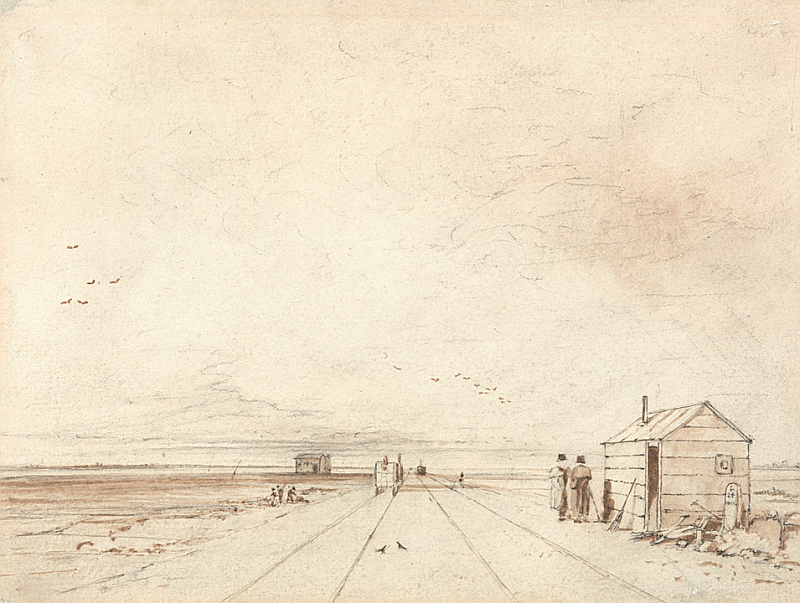 Buildings are evident in the distance (perhaps at Newton, Golborne and Leigh) and a man, probably a policeman, is seen walking towards the nearest train. The carriages suggest this is a first class "glass" train which would not normally stop for passengers other than at Newton. Interestingly, it is pulling a low wagon of some kind, possibly with additional luggage covered by a tarpaulin. To the right of the track is a small cottage. The company bought a substantial swathe of land beside the track, 50 yards wide in places, to facilitate drainage. Hence, it is probable that it is a company building. Indeed, many early prints show similar box-like structures adjacent to the track. There was a vogue for such cottages in the 1830s as evidenced by their inclusion in a popular encyclopedia of architecture by Loudon. Although the Barton building looks fairly rudimentary, such buildings were often used as entrance lodges to country estates or toll booths, both appropriate models for the proto-station. As Loudon's book makes clear, they were typically brick-built with two main rooms, both heated, and might be expected to house one member of staff and possibly his wife. This example, however, appears to be smaller than most with no windows next to the door. There is also a small bunker, perhaps for storing coal or tools. The original gatemen (and in the absence of gates I'm envisaging some overlap with the duties of policemen) were recruited from labourers formerly engaged in building the line so it's likely that low-level track maintenance was also part of their remit. The presence of what appear to be mounds of sand and gravel next to the building are consistent with such a role, possibly also serving as a depot for maintenance teams. Integrity of the track would have been a major concern in the early days, doubly so on the Moss as it drained and settled. Is this a station/stopping-place? If a location had staff then this is a possibility notwithstanding the apparent absence of formal crossing gates. Indeed, Barton Moss station does not appear to be a conventional crossing according to the 1840s map. More positive evidence, however, comes in the form of the flag post used to signal trains to stop although its location seems a little odd unless the trains are, as suggested previously, on the wrong tracks. As expected for this non-stopping train, no flag is flying. Is this location near Barton Moss? The fine patchwork of channels is consistent with Reed's drainage method where ditches were at first as little as 6 yards apart. We also see the railway embankment merging with a possible causeway beyond. This is consistent with Stephenson's initial approach, tipping spoil to create the Barton embankment as the permanent way edged out from the Manchester side of Barton Moss. However, the 1840s Ordnance Survey map suggests that the embankment (if such it is) diminished before Barton Moss station, not after as we see here. This may be a matter of degree or again artistic licence on the part of Bury. The green area seen entering on the right could be Worsley Moss. By process of elimination (there is no evidence of a bridge as at Bury Lane), it seems likely that this print shows Barton Moss station. The major discrepancy is the absence of Barton Moss Farm to the left/south, possibly for aesthetic reasons, although there are suggestions of a road or track. The building we see here may have been some distance from the farm road itself, of the order of 75 m. There are, indeed, small buildings shown on the 1840s map at this location. 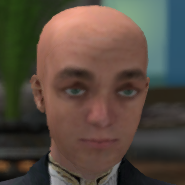 The build has a number of limitations. It does not attempt to mimic the drainage pattern seen in Bury's print and rails ran on wooden sleepers here though I suspect these were buried like their stone equivalents. The permanent way is probably also a little narrow. The build does show, however, that Bury's elevated perspective satisfactorily excludes both the hut which is 150+ m further up and the putative farm buildings (shown in red) that appear in Shaw's sketch. It is also easier to assign a station as Shaw helpfully includes a milepost signifying 24 miles from Liverpool. The first Barton Moss station was 23.65 miles from Liverpool suggesting that this location is a little east of the recorded location assuming a constant starting-point at Wapping for the measurements. If this is a stopping place then it is almost certainly Barton Moss/Reid's Farm but on the opposite/northern side of the track to the station shown on the map and the cottage on Bury's print. In this image we are again looking west but this time the trains are on the correct track. While there is no flagpole, we can see someone, perhaps a policeman, signalling the (presumably second class) Manchester-bound train to stop for the two passengers shown chatting. They are standing next to a very spartan, albeit heated, hut. According to Thomas, one of the directors, James Cropper, was an advocate of wooden structures which were both inexpensive and, as demonstrated subsequently, readily portable. Whether the structure shown here was solely for use as a waiting-room is a moot point. The two visible sides of the hut are notably devoid of windows apart from what may be a small porthole. The 1840s map shows a larger building at the milestone which seems to have a garden. There is also a larger building at the station now located at the top of the road. Like Bury, Shaw also highlights the maintenance role with tools and assorted heaps of ballast. Close examination shows a lamp suggesting that the hut was manned after dark. Behind the hut we see a probable drainage channel and a trace of buildings on the horizon (Leigh?) although they could be trees. The drainage channel, if such it is, poses something of a puzzle in terms of its height relative to the bog on either side. To the left (south) is Barton Moss but the ground-level perspective makes it harder to see the smaller channels, many of which would be covered anyway. The tall building in the distance might be part of Barton Moss Farm, notably missing from Bury's view. In later years the farm moved south and was then replaced by two others, Manor and Birch Farm, of which only the former continues. To the left is a group of labourers who seem to be working on the drainage channels. A closeup shows that one seems to have a cylinder of some kind in his hand, possibly a bottomless cask, which may be used in making the drain. Another has a ladder-like structure which might be additional support for the walls or base of the channel. Alternatively it may be an implement involved in cutting the drain. A more distant possibility is that they are building the railway cottage seen in Bury's view. The build attempts to reconcile the two views. My first thought was that the cottage (and flagpole) to the south of the tracks might simply be further along and obscured by the Liverpool-bound train on the left. However, while this could be arranged by judicious positioning of the train, the perspective makes this quite difficult to achieve. Moreover, the 1840s map suggests that the buildings of Barton Moss Farm were some 250+ m from the track (shown here in blue), much farther away than those shown in red in the Shaw sketch. Their outline is also a dubious match for the buildings shown on the map. Various explanations are more or less plausible, e.g. that these are either additional station or farm buildings. Perhaps the farm buildings were removed pre-1840s because of the noise from the nearby railway. Finally, we have to allow for artistic licence. Perhaps both artists chose to accentuate the famously desolate nature of the scene by showing only a limited number of buildings. The presence of two trains is common to many depictions but was probably an unusual sight except at Newton, midway between Liverpool and Manchester. Their inclusion was perhaps intended to show how train travel could conquer such wastes and, indeed, make them productive. In the present day, however, the pendulum seems to have swung back in favour of conserving what little remains of the original bogs and their associated wildlife. If the two pictures do indeed show the same stopping-place, they suggest that Barton Moss "station" started somewhat arbitrarily at the milestone located between two roads leading up to the railway that presumably furnished the majority of its passengers. The hostile nature of the environment required early construction of a cottage which, given its size and location, was probably not used as a waiting room. Instead, a wooden hut was provided for the purpose somewhat akin to the situation at Ordsall Lane. The role of the larger building seen in Shaw's sketch (and in red on the OpenSim view above) is unknown though its distance from the railway suggests a farm building perhaps predating arrival of the permanent way. By 1845 Barton Moss Farm was located some 250 m from the railway (shown in blue). Additional station buildings were present by this time. The station shifted west to Lamb's Cottage in late 1832. The reason is unclear but there seems to have been a degree of restructuring due to a major cholera outbreak, the first in the UK, and reduced passenger traffic. The 1840s map suggests that the cottage at Lamb's Cottage may have been larger than the one at Barton Moss and perhaps it was cheaper to relocate staff there rather than build something better at the original location. On the return of the station to Barton Moss in 1839 a larger cottage appears just next to the site of the former hut as well as a sizeable station building close to the top of the road. The old cottage likely remains until the station closes, perhaps for use by platelayers. The last step in the evolution of the station occurs in 1862 when the it moves to the top of nearby Barton Moss Road (Barton Moss 2). The old station then disappears apart from the new cottage which persists at least until 1949 and presumably continues to house railway employees. Barton Moss 2 closed in 1929. The Disused Stations website has the details (also for Barton Moss 1) but follow this link for a better picture of Barton Moss 2 on Flickr.